Ryan Farquhar took two second places in the Supertwins class as he made his return to road racing at the Ian Watson Spring Cup races at Scarborough. Farquhar finished behind Ivan Lintin in both races, with England's Jamie Cowton third and Ballyclare's Jamie Hamilton fourth in both events. The Dungannon rider announced in December that he would make a limited return to road racing this year. He will also ride at the Tandragee 100, North West 200 and Isle of Man TT. 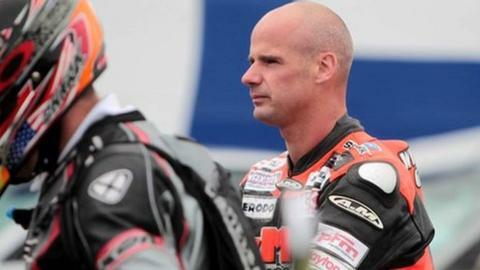 The 38-year-old had decided to hang up his leathers in August 2012 following the death of his uncle, Trevor Ferguson, at the Manx Grand Prix. Fermanagh-born East Coast Racing rider Lee Johnston finished third in the Senior race at Scarborough, and followed that up with a fourth place finish in the feature Ian Watson Cup outing. Tyco TAS Suzuki star Guy Martin won both events, with Dean Harrison second in the Senior and Lintin occupying the runner-up spot in the Ian Watson Cup. Seamus Elliott was fifth in the 600cc race, which was also won by Martin.